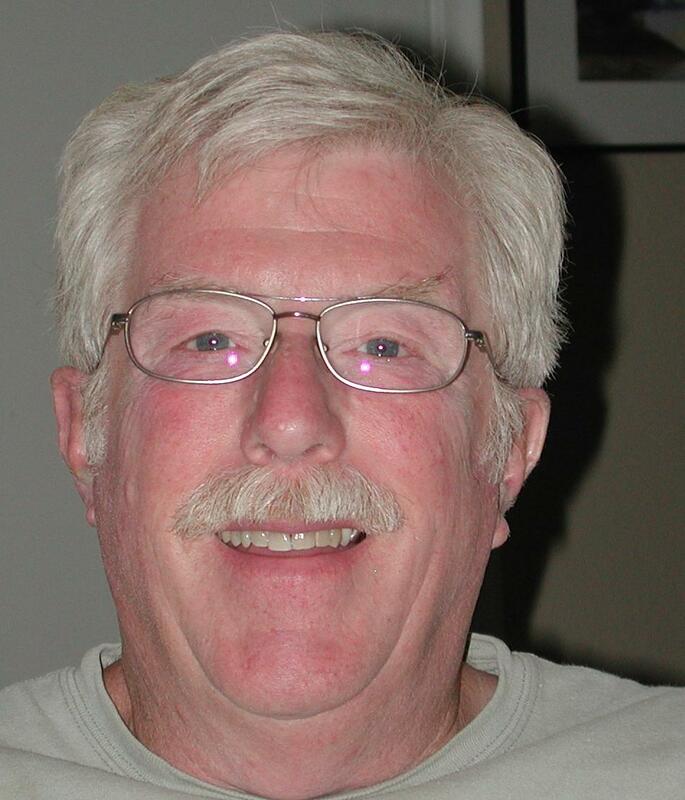 July Chas Thornhill "Making Jewelry on the Lathe"
August Tom Lohr "Everything You Ever Wanted to Know About Abrasives"
My name is John Beasley and I have lived in Denton for 36 years. I have been married for 45 years to my wife Roni and have 4 married children who have blessed us with 13 grandchildren (11 boys and 2 girls). My career was in manufacturing management where I started as a management trainee with Brown and Sharpe Mfg. Co. after graduating from Notre Dame University in 1967. I was transferred from Rhode Island to Denton to run an industrial drill plant here. I then took a job with Poco Graphite Inc. in Decatur. While working there I received my MBA in 1983. 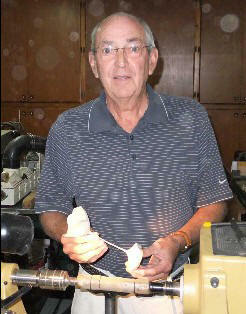 I retired from Poco in 2008 after 35 years, having served as President and CEO from 1986 until retirement. I recently became the proud owner of some Crepe Myrtle wood and thought I would try to turn it. To my amazement it turned easily and I was able to make beautiful extremely thin stemmed goblets. I demonstrated this at the GTW Open Shop last month and several turners have attempted to duplicate the process. My plan is to demonstrate the technique to make the goblets, without breaking a single one. At least that is the plan. I will also be bringing several green blanks to the meeting for members to take home and make their own goblets. My name is Glynn Cox. I was born in Shreveport, Louisiana and raised in Albuquerque, New Mexico. countries working with customers on their custom configurations. I have always been a “hands on” type of person and was tutored from an early age by my dad in the art of fixing and building everything. I have not deviated from that as I not only enjoy woodturning but also “flat wood work”, metal work, antique restoration and electronics. season. I have incorporated a few of my own ideas along with some gleaned from a finial class with Cindy Drosda. I will attempt to demonstrate turning hollow thin wall globes with very long decorative “icicles”. I say “attempt” because it is quite easy to cut through the side of the globes or break the thin icicle. Hopefully that will not happen during the demo though I am sure the audience would enjoy an Uh-Oh! or two. I will discuss materials, proportions, tools, turning and finishing techniques. "Offset Turning Ducks with a ShpeShifter Chuck"
Mike Darlow’s book Woodturning Methods has a chapter on multi-axis turning and includes an article on turning off center ducks. He discusses three different methods of turning them. After reading his article I became inspired to create a gaggle of my own. It is my nature to explore alternative and cheaper methods for holding material. My original thought was to build an off center chuck out of PVC. I wanted to experiment with various sizes so several PVC chucks of different sizes were made. The very first ducks were turned with these chucks. They worked well until one of the chucks exploded while turning. That’s when it was determined that PVC should not be used off center. It doesn’t just come apart; it explodes with pieces flying everywhere. When PVC breaks it is like glass with very sharp edges and is very dangerous. That put an end to my duck turning, or anything off center with PVC, until I could come up with a safer method of doing it. The demonstration for this month will be how to use the ShapeShifter Chuck in turning off center ducks safely, and how the chuck works. We will explore a couple different ways of holding wood on the chuck along with ways to reduce the weight for reduced vibration. The chuck is very versatile and can be used to turn a variety of items off center: bowls, pens and bottle stoppers for example. The one concern that you will need to address is the speed at which your lathe will allow for off center turning before it “walks” via vibration. At the AAW convention last year in Hartford, Ct I met Dan Hoffman of Offcenter-Tools and was introduced to his ShapeShifter Chuck. After discussing with him my desire to find a safe way to turn off center he convinced me to try his chuck. It turned out to be the solution that I was looking for and is a safer way to turn off center. 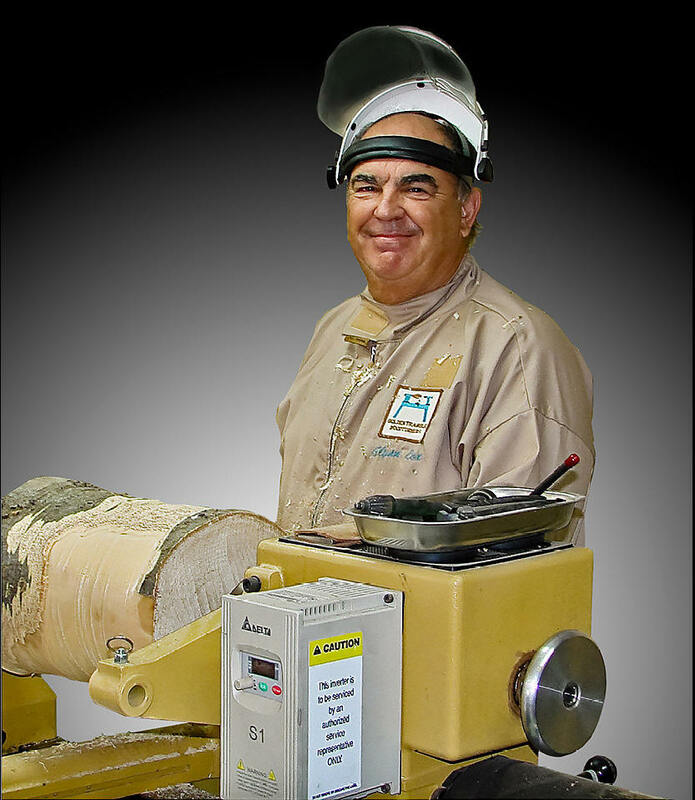 "Everything You Ever Wanted to Know About Abrasives"
After several years in the radio, television, and recording studio fields, I spent 5 years with Honeywell, then 30 years with 3M. At 3M, I started with liquid adhesives, then they added double coated tape and hook and loop. Later they added single coated tape. After all of this they decided they needed specialists in each field, so I became the Adhesive Specialist for the south central United States and Northern Mexico, with a side trip to China to train their sales reps. Several years ago, my manager asked me to help by moving to selling abrasives and training all of the new adhesive reps at the same time. I have been interested in woodworking ever since 7th grade shop class. I have progressed from simple things to decks, kids’ playhouses, furniture, cabinets, and entertainment centers. I was able to acquire tools as I needed them for new tasks and when I retired in December 2009, I took the Jimmy Clews class at Canyon Studios. Several months later, I bought a Delta Midi lathe and started practicing on cheap wood. After a lot of practice bowls and spindles, I used some of the good wood I bought last at SWAT. After storms, I now travel with a chain saw in my truck because I love free wood. "Making Jewelry on the Lathe"
to-shoulder with dozens of passengers crowded around a display of native crafts. I had probably seen hand-turned bowls at other times in my life, but there in that gallery, I saw bowls and platters turned from native Alaskan woods and displayed, not as kitchen utensils, but as art. The beautiful lines, rich colors and textures, and exorbitant prices captivated me. And I uttered the words my wife has come to expect in just this sort of situation: “I bet I could make that.” When we returned from that cruise, I wasted no time. I dug an old Shopsmith out of mothballs (it was rusting away in a buddy’s barn) and cleaned it up. I had never used it as a lathe before, so I had to find all the parts to make it serve that purpose. I recognized that I had no idea what to do. So I looked online for a class and found one scheduled at the Woodcraft store in Addison. It was to be taught by a fellow by the name of John Horn. You might know him. I took his class and discovered in those few Thursday evenings a new and somewhat addictive art form that suited my particular aptitude for creativity, design, and motor skills. In the two years since (August 2011 will be the 2nd woodturning anniversary) I have covered a lot of ground. made on the lathe. 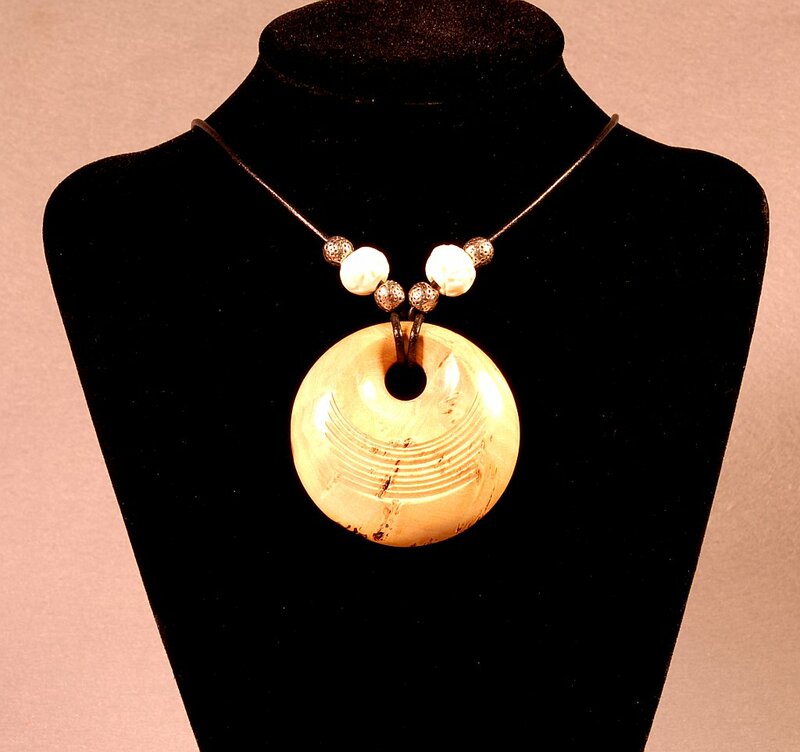 I was impressed by the elegance of the simple drop design and the exotic wood. I had to try that myself. Over the months, I turned many beads, pendants, medallions, and little things I call talismans. I found that wood leftover from turning pens, bowls and other larger items did not necessarily have to go into the trash. They were likely candidates for pendants, earrings, broaches, crosses, and lots of other objects that both conserved the wood and improved my turning skills at the same time. I discovered that as long as I was comfortable working small and near the headstock or chuck, I could convert leftovers into great little gifts or (as I found out later) a little extra income. I will demonstrate for you how I create beads, pendants, and, if we have time, I’ll turn a small cross. Since I am still relatively new to woodturning and don’t profess to know the “right way” to do everything, I don’t consider this a class. 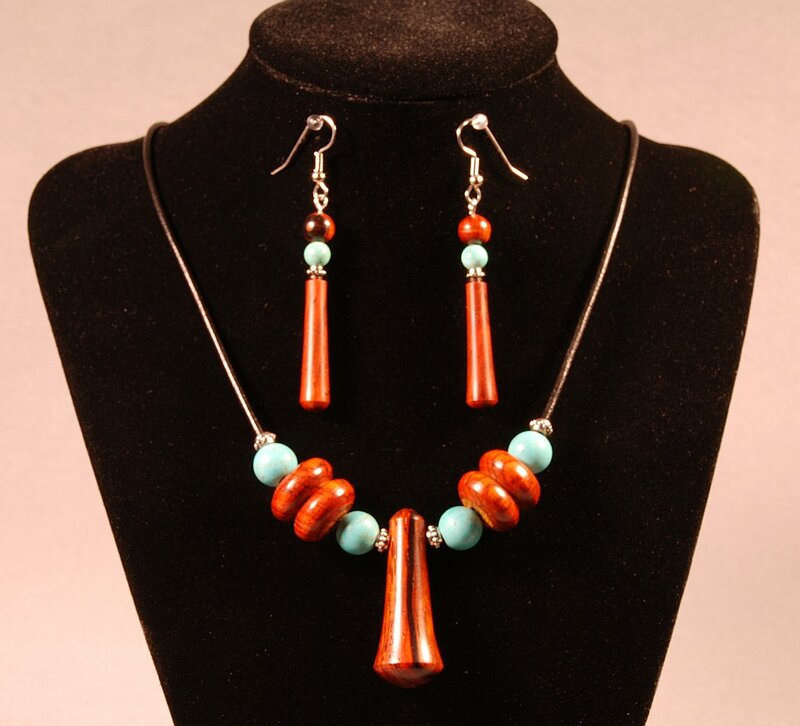 It is simply a demonstration of how I make the pieces and a few tips and tricks for turning them into simple, yet functional necklaces and earrings. 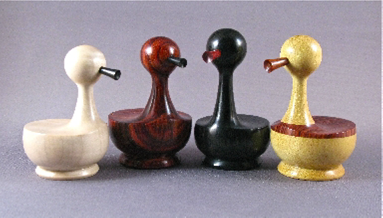 The 2007 spring issue of American Woodturner had three articles relating to Ornamental Turning (OT). These articles inspired me to investigate OT as a possible way to enhance my wood turnings. One of the articles described the construction of a rose engine lathe constructed primarily of medium density fiberboard (MDF). I thought to myself: "That is kind of neat, but it doesn't do all of the things I would like to do; besides I have a perfectly good mini-lathe. Why should I make one out of MDF? Why don't I just figure out how to make my mini do the job?" So, I proceeded to do just that. A rose engine lathe works on the principle of a pivoting headstock that is controlled by a cam as it rotates. A rotating cutter cuts a pattern into the work as the work rotates. The resulting shape is controlled by the shape of the cam. The mini did not have a pivoting head stock, so I decided to just pivot the whole lathe. The mini did not have a place to mount the cam, so I created an extension of the spindle shaft on which to mount it. There was no means to manually rotate the mini, so a rotating mechanism was added. There was no place to mount a rotating cutting tool, so a movable compound platform was added. All of these additions created a rose engine lathe, but I wanted to be able to make spiral cuts and straight cuts(flutes). In order to do these cuts I had to devise a means to couple the translation of the compound to rotate the headstock at a controlled rate to make spiral cuts. Then in order to make a series of complementary spirals, I needed a means to index the work relative to the lead screw of the compound. A means to lock the work in a fixed position while the cutter was translated by the lead screw was added allowing it to make straight flutes. Multiple flutes are then cut by indexing the work in increments. As a result of these additions the mini has approximately doubled in weight and the Herber Hybrid Ornamental Lathe (HHOL) was born. In my program I will cover some of the history of OT, I will show some pictures of examples of OT (both past and present), and I will demonstrate some of the capabilities of my HHOL. I have been retired since 1999. I worked in my former life as an electro-mechanical design engineer. I have been a member of WNT since 2002 and I am also a member of Ornamental Turners International (OTI), an AAW chapter of ornamental turners from all across the USA as well as Canada, UK, Australia, Finland, Germany, and New Zealand. At the age of 10, my father put me in front of an old lathe and taught me to turn spindles for a room divider at our house in California. At the time I wrote it off as a noisy and scary experience choosing not to do it again for 25 or so years. I picked up woodturning again after moving from California to Texas in ’94 and taking a class at a local store. After going obsessively into woodturning, and starting to sell my work at craft shows, I was looking to expand my horizons and saw some pictures of square pieces done by Australian wood turner Vic Wood. Not knowing how he did it, I started experimenting in turning square. About that time, I helped found the Dallas Area Woodturners, a local chapter of the American Association of Woodturners (AAW), and have since served as camera man, Vice President, President and continue as the newsletter editor. I would definitely list my specialty as square turning. My initial experimentation in square turning was published in the December 98 issue of the AAW journal, a quarterly publication of the American Association of Woodturners. At the encouragement of the publisher, I started demonstrating my techniques. Like all things that are practiced and experimented with, it too has evolved into the current methods described and illustrated on my web site www.turningwood.com, and in numerous correspondences with other woodturners. Over the last 3-4 years I have participated in many of the local juried fine art shows, up to 10 a year. Most recently, I have shown in the Dallas Artfest where I was honored with “Best of Show”, and a featured artist at the Huffhines Trails Artshow, in Richardson, TX. Much of my work is done in wood native to the south. I also am very active in encouraging the use of native trees and starting up a method of notifying local turners when there are trees available for their use and making sure that they are put to use in woodworking vs. going to the local landfills. These trees have been removed because of development, disease, or storms, never just for woodworking. In fact, I try to encourage people to keep the trees standing if at all possible. my techniques at both the largest and second largest woodturning symposiums in the U.S. in 2001, and have expanded the program and demonstrated again in 2002 at our national symposium, in Providence, RI. When I retired in 2002 wood turning was not on my retirement agenda; instead, flat work and fishing were going to be my leisure activities. The flat work phase came and went with book cases and simple furniture being made for one or another of my six children. Then out of the blue the VORTEX hit! My wife Susan and I were attending a wood working show in Arlington looking for a new project for me when she spotted a mini lathe. She told me, much to my surprise, that she would like to get one to play with and maybe spend some time with me in the shop. It is impossible for me to turn down an opportunity to get a new tool so it came home to my shop and we dove head first into the wood turning vortex. We soon attended several classes together, and I was off on the quest for the perfect bowl. After joining the WNT club and expanding our knowledge base, I discovered that the perfect bowl is the size of a salad bowl but you can’t turn one that size on a mini lathe. And then came an excursion to SWAT in Wichita Falls to bask in the reflected glory of all the really good artistic turners. BEWARE for SWAT may cause you to take out a second mortgage on your house! I bought lots of neat stuff and learned lots of neat things. Then in the very last hour of the last day we were walking by a booth set up by one of the wood craft stores. They were complaining among themselves about having to load that heavy &*%$(*& piece of scrap iron….My ears perked up and I smelled a deal about to happen. It was a POWERMATIC, and I was in love again…..We cut a deal for $450 off the price, and I stood there dreaming of turning whole tree trunks on this monster! Then the reality hit me - how was I going to get this 700-lb beauty back home? At the same show, there were a couple of guys selling mobile bases for the Powermatic, and I bought the base from them, and they were able to get the base under the Powermatic for me. So here I am on Sunday afternoon in Wichita Falls trying to rent a trailer to transport the lathe back home. Long story shortened some…..we got it loaded and home and I haven’t done a piece of flat work since then. My efforts at becoming one with the lathe seem to run about a year-long effort on one type of turning and last year my project was turning pens. I did 10 or so wooden pens experimenting with different shapes and was on the edge of being bored when I thought I would try different materials for a pen. I picked up several pine cones and went to work and was actually able to make a pen out of pine cones!. I only made one pen out of pine cones and then needed to move to something else (that should give you an idea of my attention span). Having some interest in segmented turning, I applied segmenting concepts to making acrylic pens and that was good for a much longer learning curve since my three daughters all wanted one of those pens. For 2011 I am going to focus on segmented projects. That’s the best thing about turning, there is always something new to learn and try. I became a member of North Texas Woodturners in 1992. And, in 1993 I attended the second annual Texas Turn or Two gathering in Columbus, TX. (It's now known as SWAT.) I brought home lots of knowledge and ideas from there. But, my best inspiration was Larry Roberts; he taught me and many others in the Woodturners of North Texas -- even people from West Texas. Now, I am a member of the Dallas Area Woodturners club. Over the years I have attended woodturning classes at Arrowmont in Gatlinburg, TN as a student and as a teacher’s assistant. Closer to home, four years ago, I became an art student at Collin College to study other types of art media. 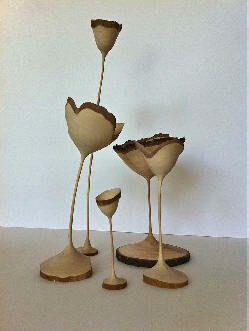 Now, I enjoy mixing other media with woodturnings and making large sculptures. (Examples in pictures attached) During this time, some of my college classmates became interested in woodturning, so I now run the woodturning lab and teach them part-time. This demonstration will show how to turn a ball inside a box. This was described in “Woodturning,” a magazine from the UK several years ago. For you to do this, it will take one homemade tool and a homemade wood chuck jaw along with a little patience.